Have you ever found yourself in the middle of a change and all of a sudden the decision to rollback the change is taken? Did you have a plan to follow? Or did you wing it? If the latter was the rollback successful? Or did you miss a step, that came back the next day to bite you? I’ve been there, done that. And because I learn from my mistakes, I don’t wing rollbacks anymore. Why do I need a ROLLBACK Plan? – you need to know how to restore the database or application to the initial state, the one it was pior to the change. When the decision is taken to rollback, it is a critical moment, stress levels are high, panic sets in, and even worst, it is the middle of the night. Thinking clearly and sequentially is hard. This is when most mistakes are made without a proper plan. – it is not a conversation in the lunch room about what can be done if a change fails. – it is not a scribble on a post-it. – it is not a “Oh-I-know-what-I-need-to-do-no-need-to-write-it-down” idea. A rollback exists only in the context of a change. I consider change, any type of new code deployment, parameter changes, upgrades, patching, outages, even some password changes. Some of these changes will not require testing all the time, such as an outage (you test once, record the steps and you are done). Some of these changes will require extensive testing and multiple deployments. The MAGIC INGREDIENT is called: THE DEPLOYMENT PLAN. Without A DEPLOYMENT PLAN, a CHANGE or DEPLOYMENT is doomed to fail! What is a good DEPLOYMENT PLAN? You get the picture where the rollback plan fits in. What is a ROLLBACK PLAN? – it is a WRITTEN DOCUMENT that outlines (just like a deployment plan), all the steps that are required to recover the database or application to the point before you started the deployment. – it is a PLAN, with specific steps for each participant in the deployment. – it is a TESTED PLAN. This is a very important distinction to make. 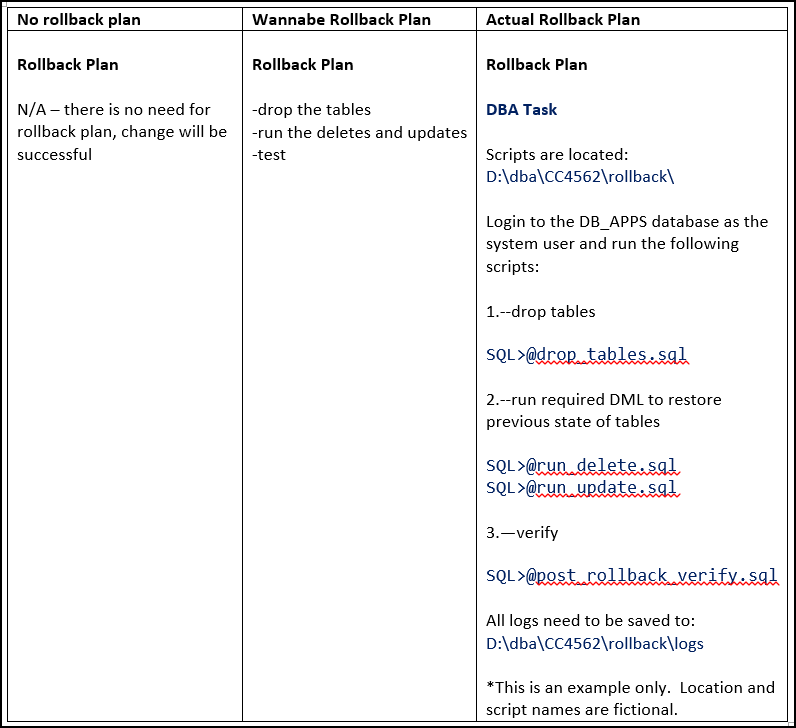 The Rollback needs to be tested, just like the deployment, in order to determine all the components of the plan. The 5 key ingredients for a successful rollback are: (1) written, (2) tested, (3) detailed step by step plan, that contains the following (4) location of the scripts, (5) database name and user who runs the scripts. Because a picture is worth a thousand words, let me show you the difference between a deployment plan without rollback, wannabe rollback, and an actual rollback plan. 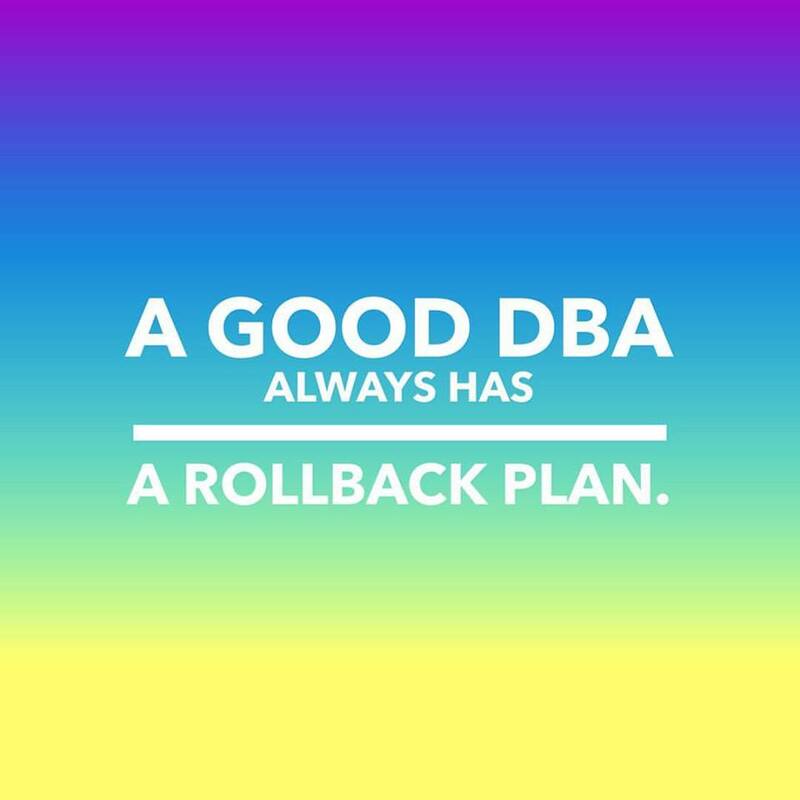 Remember this, A Good DBA always has a rollback plan!